Make a donation to help Preservation and have your custom memorial phrase laser-engraved into a brick for the future Welcome Courtyard. A sketch from the early COurtyard design process. A beautiful Welcome Courtyard will eventually grace the approach to the Accessibility Connector and the Meetinghouse. Located between the parking lot and the buildings, this Courtyard will combine graceful brick paths and patios with elegant planting beds filled by horticulturist-selected native and historic plants. Memorial benches will offer seats for restful meditation, or simply a place to wait for others coming or going. You can help fund the completion of the Elevator and Accessibility Connector by donating memorial bricks for the Welcome Courtyard (donors have already ordered the available Memorial Benches). 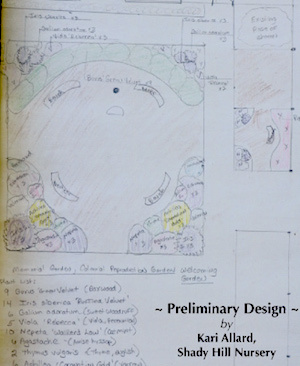 The Courtyard's schedule and final design are not yet determined, but we need your donations now. We expect the Welcome Courtyard to use about 1,500 bricks, so order yours today while they're still available! We're working with one of the most experienced memorial brick firms in the country to produce beautiful, lang-lasting, winter-hardy laser engraved custom bricks. For a donation of $100, a 4” x 8” brick engraved with your phrase or dedication will be built into the Welcome Courtyard. For a donation of $250, get a larger engraved brick (8’ x 8”) with a longer phrase. Order online here with a credit card, or download an order form and mail it in with your check. Memorial Brick, 4" x 8"
Your donation produces one 4" x 8" brick, laser-engraved with your custom memorial phrase. Memorial Brick, 8" x 8"
Your memorial phrase will be laser engraved into a 8" x 8" brick.